they may be axial or radial leads. 2. Install the SMD quad ring diode - HSMS-2829. 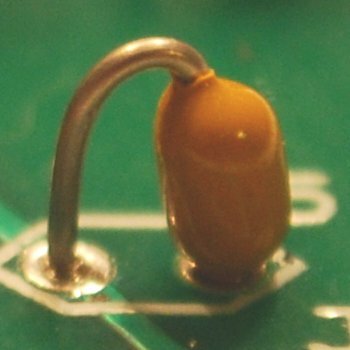 Create a tool to hold the SMD in place on the PCB. I used a tooth pick with the tip cut off. 4. Install all six capacitors. If the caps have radial leads, straighten the leads to fit the 0.1 inch holes. If the caps have axial leads, bend one lead 180 degrees at the body of the cap. 6. Install the PIN Diodes. DO NOT OVERHEAT WHEN SOLDERING. This Mixer is only active in transmit mode. or 1.4 volts P-P from 50 ohm sources. 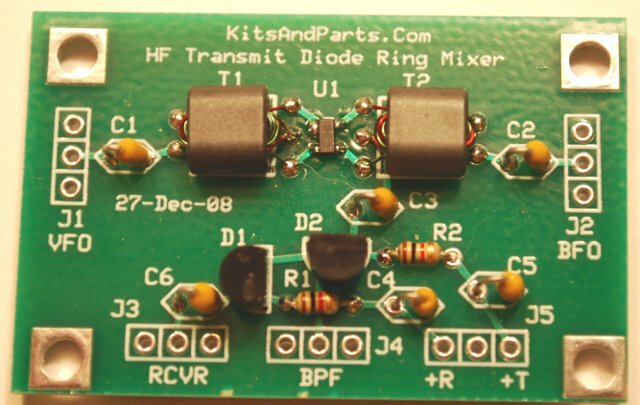 passes RF from the Band-Pass-Filter to the receiver front end.